Software engineering today is as much about people as the technology itself: an internal tech conference can give a huge boost to your organisation's social capital - that currency by which relationships flourish. The format you choose for your internal tech conference depends on what you want to achieve from it: it can be "by the people for the people", or a showcase to celebrate achievement. You can keep the audience or speakers to just a single department, or invite other divisions, or even invite external speakers and/or audience. Making the event a success takes effort: choose your speakers well, and mentor them as they prepare their talks. Work on the logistics - it's the little things that count. Remember to have fun: 'death by PowerPoint' will mean people remember the event for the wrong reasons! An internal ‘tech’ conference can be a powerful way of communicating and celebrating technology teams that build and operate the software systems that are increasingly essential to many organisations. In this article, we share our experiences of organising and running internal tech conferences: getting buy-in, preparing speakers, promoting the day (before and after), and running the day itself. We hope that you’ll be inspired to help run a tech conference within your own organisation! Why run an internal tech conference? Building and operating modern software systems is a challenging task: the pace of delivery is rapid; the opportunities (and threats) from a global, web-connected population are immense; and we need to draw on a wide range of skills and experience in a coordinated, joined-up way. The world of work is now highly complex, meaning that instead of streamlining our organisations to continue producing the same output more efficiently ad infinitum, we need to enable them to be agile, to respond to constant change around them. Internal tech conferences can help people to build relationships and discover more about things that are going on in a friendly environment and non-threatening context, so that they have the confidence to wholly participate and know that others will be able to get in step with them to help make new ideas happen. In this article we draw on our personal experience of running internal tech events companies we’ve worked with, along with reflections and advice from people at Paddy Power Betfair, Callcredit, ING and others. You’ll find further reading & listening material at the end of the article - there is so much inspirational work happening in so many organisations. What types of events work well? The Financial Times, the world’s leading business news provider, decided to run a full day event with a mixture of content and debate from a diverse set of people across the department, joined solely by an internal audience. Their conference consisted of Lightning Talks, Panel Debates, Open Spaces and a game, rounded off with beer, chatter, and more beer, writes Victoria Morgan-Smith. A panel at the FT’s Engine Room Live event get ready for a question on its way from the audience - complete with soft blue throwable microphone! When planning the first internal tech conference at a ticketing company based in London, writes Matthew Skelton, we realised it would be a good idea to invite teams outside of technology/engineering to learn what the tech teams actually did, as that was a mystery to many people; the sessions were known as ‘Engineering Day’. All staff in the London office were invited. The first installment was a full day session with many different speakers from the engineering teams (and some from other departments too). Subsequently, the team ran a focussed half-day Engineering Day events every six months which allowed more people to attend as they found it easier to spare a half day rather than a full day. Teams in India were included via video conference and eventually the show went ‘on the road’ to the teams in Edinburgh. At the Dutch bank ING, an internal change from older, silo-based ways of working to a more fluid, DevOps-inspired approach was accelerated by running an internal conference based directly on the DevOpsDays conference format, combining external invited speakers, internal talks, and short ‘lightning’ talks of 5 mins each. This event helped to “stir up the discussion” around new ways of working and inspired people to attend and help organise a public conference (DevOpsDays Amsterdam). Furthermore, after the ING people blogged about their conference and shared the slides, a team at US retailer Target were inspired to run their own conference! The recently-published DevOps Handbook by Gene Kim et al has more on this. Callcredit, a major provider of financial data in the UK, has run a public-facing Testing conference called the Leeds Free Testing Atelier. It was a one day event, with a mixture of Testing related workshops, talks and games. Stephen Mounsey explains that their ambition behind it was to “kick start a vibrant testing community. After seeing the remarkable community spirit of the Ministry of Testing and Test Bash conferences, we wanted to replicate this on a smaller scale for Leeds. We also wanted to get to know other testers, get ourselves some social connections, someone to share our problems with.” They were keen that the event was “by testers for testers”, but actually attracted a much wider audience of DevOps engineers, UX, BA’s and developers. There is no ‘right way’ to run an internal tech conference - it depends on what your team, department or organisation needs. An important thing to consider early on is the audience: who should we invite? Who would benefit most from the conference? The answers to those questions should help to frame your conference planning: as the attendee list grows the focal point of discussions stretch to fit the audience, whereas a compact group allows the focus and aims of the conference to remain tight and on track. Another factor to consider is whether you bring in external speakers and the impact this could have; it can have the effect of feeling like an industry conference without the cost of flying everyone to another country! However you choose to run your internal conference, it’s important to give people enough time and space to immerse themselves in the event - help them clear their calendars so they can ‘shake the every-day out of their hair’. This is a chance for people to give themselves permission to pause - they need to be ready to get as much out of the day as possible. An event like this has many immediate, measurable benefits, as well as some hidden, long term ones. One major goal is to shape and promote ‘good’ culture, where people are encouraged to challenge the status quo, to get excited about new possibilities by having the space to experiment without the fear of failure. Psychologically people are braver surrounded by people they know and trust; an internal tech conference can bring people together - help them to get to know each other in an open context, allowing opinions to flow ideas to happen. What do speakers and presenters gain? An internal tech conference is a great opportunity to identify and celebrate ‘unsung’ people, teams, and achievements; it’s a way to showcase team projects that might be forgotten or that do less exciting but crucial work. It’s a great way to make people feel that they are being appreciated. Matthew’s team deliberately looked for people who had done interesting, foundational, or transformative work: database upgrades that allowed them to shift platforms, deployment automation that reduced outages, and what it’s like to be on the 1st-line support team. Speaking at an internal event will force people to challenge themselves. Those opinions they’ve been expressing on a daily basis to their neighbours? Well, if they want to express them on stage, they might want to check some facts, reflect on what they’ve heard and read elsewhere, and then do a bit more research to be sure they know what they’re talking about. A team can easily become a small echo chamber, so it’s healthy for people to poke their head out of it occasionally. Then they can say “hey, it’s not just me - other people are saying this stuff too!”. Many conference speakers will tell you that the biggest thing they get out of talking at an event is the extra learning they do in order to test and flesh out their message. To many, public speaking is the most terrifying experience in the world, consequently many great ideas and opinions remain unheard. If we can help people tackle that fear, that’s a huge gift. Several people from the our internally run events have now been talking at external conferences as a direct result of gaining confidence to do so at internal events. We’re now hearing from people whose voices were not heard before. One of the big benefits for attendees is the buzz of sharing insight and successes; this makes an organisation feel like a great place to work. The FT was able to get energy going early by starting the day with ‘Lightning Talks’ where speakers shared thought-provoking ideas about technical challenges and about human behaviour in the space of 4-5 minutes. The events at the ticketing company had two parallel streams of talks along with tutorials for non-techies on HTML and simple website design, delivering something for everyone. In both cases, attendees felt a strong sense that they were worth investing in. Another benefit is the validation that comes from hearing colleagues talk about practices used elsewhere in the industry too. By bringing a piece of the outside world into a company, everyone gains better understanding of how their shared work makes up a bigger picture. Often this involves reinforcing they’re doing the right things already - a big motivational factor. The main benefits of an internal tech conference are ultimately social: improved interaction, trust and understanding between people and teams. Selling the value of the event may simply be a matter of selling the importance of these aspects to your work environment. The FT’s event started with some engineers chatting over drinks with their CTO. They suggested an internal event to him as a way to get ideas discussed and experience shared, getting more than they bargained for when he then asked them to organise it! The successes of the event was sufficient to sell the idea of a second one the next year. Improved learning: a significant increase in lunchtime/evening tech talks; engineers self-organising regular open discussion sessions. Increased engagement: working groups set up by groups of developers to delve into particular challenges (e.g. alerts overload on microservices!, smarter cloud management, new approaches to quality assurance). Inter-team communication: improved communication between the technology department and the rest of the organisation, opening up dialogue that was not possible (or not happening) before the events. Inspiration: a Product Owner, inspired by what he’d heard, taking back to the Product team a long list of ideas where they could collaborate better with the tech team on tackling some of the next big challenges. Staff retention and recruitment: speakers taking to the stage at external events, which in turn has brought good candidates applying for jobs. Jess Lancaster of TechSmith  makes a great point about the impact of the safe environment we’re striving to create: "It makes it likely the person, who may be very shy, will come out of their comfort zone and do something they would not otherwise. That breaks open information, but it also gets people used to pushing their boundaries." So, inspire people to be proud of their successes, and they will do even more. To help ‘top and tail’ the event with a buzz beforehand and lasting memories afterwards, make sure you sort out attractive posters and good quality photos and video footage. A day like this can have many moving parts, so the FT had someone in place to “stage manage” the day. Each talk had scribes, mic throwers (for ease and entertainment! ), a timekeeper and a “Slack channel watcher” in case of questions or problems from remote team members. Making sure everything runs to schedule and logistical transitions are smooth (including ensuring people have clip-mics switched off if they go for a last minute bathroom “visit” before going on stage, ahem…). Having an in-house “Chief Worrier” is a blessing! You have to consider having one or two ‘plants’ (people prepared) in the audience who are primed with interesting questions. People can be shy and can find it hard to be the first to ask a question, so if the plant asks the first question, that can open up the discussion. On top of that, it can take people a moment to absorb what they’ve been listening to and formulate questions, as well as planning how to articulate this without stuttering or tripping up verbally. Having a confident ally planted ready to ask a worthwhile question if there is silence can really help others to follow suit. Conference organisers need to be prepared for when one or two speakers drop out for whatever reason (emergencies, illnesses, nerves). Having a couple of backup talks ready with willing participants who don’t mind not getting to speak if disaster doesn’t strike is essential! 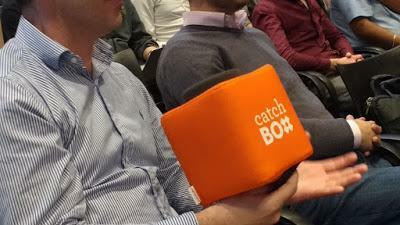 The ‘catch box’ microphone at the FT.com tech events was a big success, leading to more interactive and spontaneous questions than with handheld microphones. If your organisation is distributed, then consider what level of involvement you want from smaller off-site teams. The FT sought input in terms of what topics and questions would be asked, but on the day itself it was a one-way broadcast from the main office. Local posters, and local pizza, with live streamed YouTube content was as far as they went. Matthew’s team arranged to incorporate sessions from India via video conference, and also took a small team to a branch office in Edinburgh to replay talks and answer questions. During the day, having a variety of sessions keeps things lively. Lightning Talks and presentations can inspire, Open Spaces can stimulate broader discussions, and panels can enable lively debates. A good game towards the end of the day can set everyone up for the all important drinks at the pub after where real networking takes place. The FT were keen to keep all of the speakers internal for two reasons. The first was about maintaining the safety and security of the space - not only in terms of feeling safe to fail, but also in terms of confidentiality. Attendees and speakers were allowed the freedom to say anything they liked. Rich Haigh from Paddy Power Betfair has the same view about the need to be able to present “stuff that might be too sensitive to discuss externally”. The second reason was related to the objective of giving people a voice, and showing them their opinion is respected - bringing in external speakers for the FT’s event was considered to undermine and distract from this. Less experienced speakers often wildly underestimate how long their talk will take and end up writing too many slides and rushing the talk, trying to fit in all the material they prepared, or overrunning by 15 or 20 minutes. Avoid this by mentoring speakers: help them to prepare a slide deck (one slide per minute of talking is a good guide) and ask them to present the talk to you a few days before the event so that they can practice the timings. Make sure the material is suitable for the audience, too; there is little worse than someone talking ‘tech’ in a way that is incomprehensible to the audience. If the talk is too long or too ambitious, help them to trim the unnecessary bits - be kind but firm! Rich Haigh at Paddy Power Betfair found that “The biggest problem was that I was intending to take a large number of the tech staff out of the business for a day. In order to mitigate this, we always set up a war-room.” Because they were off-site for the full day, they needed to create a specific set-up to allow essential support to continue. Holding your event on-site could enable people to opt into specific parts of the event they are interested in and also means their availability in case of disaster isn’t an issue. This is definitely one to bear in mind when designing your event. Revise the list - then go and do some sweet-talking! Some might say that this is artificial, but in technology departments across the industry we find ourselves in a bit of a bootstrap situation of a less-diverse-than-we’d-like workforce, and it takes conscious effort to get out of it - it’s worth going the extra mile!. Crucially, make sure you have speakers from teams or departments across the spectrum of the attendees; specifically, if you have only extravert developers talking, then more reserved DBAs, support people, Ops and security people will feel left out! Find ways to include a range of subjects and people from different backgrounds - you will likely be pleasantly surprised by the result. What benefits result from a successful internal conference? "An internal conference can be a fantastic opportunity.”, says Cait O’Riordan, CIO of the Financial Times. “We go to external conferences to learn from other companies and an internal conference ensures that we also learn from the brilliant people inside our company. Ideally that would happen anyway in the course of our daily lives - but putting some time in the calendar makes sure that sharing actually happens and happens at scale”. An extra element for O’Riordan was the timing of it: “Our conference happened to coincide with when I first joined the FT - so on a personal level it was a brilliant opportunity to find out about the great work the team is doing." We gained exposure in the local marketplace. We got awesome speakers to come and talk to our people for free. We have enthused our staff, given them the confidence to get out there and speak. We have created an external support community for our people. It seems to be particularly useful when the events occur regularly and people start to look forward to the next one. Capture the good ideas being thrown about during the event, and follow up afterwards to encourage the people who raised them to take their ideas forward. Send out a feedback request form immediately after - ask “what will you do differently?” - encourage attendees to think about what the day has meant to them and generate some intention to act. Finally, write up a summary of the day on a public tech blog. It acts as a great reminder to those who are tempted to quickly forget the event! You could choose to run your event “by the people, for the people”, like the Financial Times have done. In this scenario, all talks and events are done by people internal to the department with their colleagues as their audience. They charged people up and let them loose on topics designed to generate heated debate. You could also turn the event into a real showcase and invite the rest of the company to come and meet your engineers and hear about some of the exciting things they’ve been doing. Here you could be uncovering some of the challenges of delivering modern software systems and building a dialogue between the technical departments and the rest of the organisation. Onlignment hit the nail on the head when they say conferences are “at their best when lively and interactive, highly relevant, varied, primarily bottom-up but with some inspiring top-down input;”. Whatever format you choose, remember that people will get out what they put in - so the more you can involve everyone in the up front contribution of ideas, organisation and actually taking part in the day, the more they will feel it is “for them” and the more they will take away from the event. We’d like to thank the people we interviewed for this article: Stephen Mounsey of Callcredit, Jan-Joost Bouwman of ING, Rich Haigh of Paddy Power Betfair and Heather Mickman of Target. We’d also like to thank our past and present colleagues for their huge contributions to making the tech conferences there a success - these events are always a team effort.